Announced on Friday 28th December, the Weybridge Rowing Club Junior Squad Team are the winners of the ARA Exceptional Team of the Year award, for 2007. The ARA mention that the award, run annually, is for the coaching team that has made the most significant impact on the performance and/or development of a group of athletes during 2007, whether working with a group of young people who were new to the sport or a group who were aiming for National Championships. Jack Percival, Chris Jones, Tom Oxton, Matt Beagley Tom Capel and Julia Lowes. Not only did these juniors help out but were greatly assisted by skilled adults, who's help will not go unnoticed. All of the WRCjnr Team would like to thank every person who has helped 2007 be a brilliant year, not just for the Junior Squad, but for all of Weybridge Rowing Club, as we continue progressing and developing as an entire club. We must make sure this is continued and built upon as for all of 2008 we 'Imagine the Possibilities'. Once again, Weybridge Rowing Club is hosting the annual Christmas dinner, to which all Junior members are invited. There will be training both days. Burway SBH on 8th December has been cancelled. I don't anticipate beginners will be on the water this weekend, so please bring bikes. Also bring a change of clothing, just in case we have the opportunity to go for a little paddle. Matt Beagley, Oliver Tomalin, Sebastien Kirk, Lloyd Cheesman, Callum Russell, Daniel Fisher, Jack Shepherd, James Coxhead, Lizzie Adlington, Kirsten Owens and Alice Turton. If you put your name down to enter, but aren't on this list - thanks for entering and sorry but I had to amend the list to take account of the experience and ability of those chosen to cope in tricky conditions. Even so, our entry depends on Caroline and I reviewing the stream conditions for safety early tomorrow morning, and if we are not happy we will withdraw. We hope this will not be the case. P.S. don't forget the Club Christmas dinner on 15th December, if you are available. Congratulations to WRCJnr Callum Russell for gaining Gold at the Indoor Rowing Championships last weekend. Veteran Peter Morley also come home with a Silver medal. Even if we can't boat out this weekend we will be doing training of some kind. We have some great stuff lined up for you. We have been invited to join St. George's College Boat Club in a fun event which they call the 'Christmas Pudding Row' on Saturday 8th December at 10:00. Please see the notice in the clubroom, and sign up for it! With the first head race of the year, Silver Sculls only days away, the coaching team would like to offer the following top tips to the Juniors in order to get the best out of your race. Good luck and race well! If you have any more questions please do not hesistate to email us and we will be happy to help. The annual WRCjnr Halloween Party will take place on Saturday 27th October, and will run from 7:30pm - 10pm. Entry will be £6 and if you intend on coming can you please put your name up on the notice which is on the noticeboard. You are more than welcome to bring mates, but once again list them on the noticeboard so that we have a rough estimate of numbers. Sheila has requested that people who are willing to help set up and decorate the clubhouse inform her of their availability, alternatively email us and we will pass your message on. Unfortunately, there was a slightly disappointing edge to our success at Lea Regatta (2/9/07) in that very few people turned up to unload the trailor and re-rig the boats last night. If you race for the club and use the club's equipment then you must contribute to both loading and unloading the trailor. It is unfair to expect the same people to do it everytime. In more upbeat news, the Weybridge support at Lea Regatta was - once again - top notch as we clearly established ourselves as the loudest support on the bank, intimidating even the home club. Lets keep it up! Some of you may be aware that Weybridge Rowing Club's Junior Squad has a representative in the FISA World Junior Rowing Championships in Beijing, China. After storming into the GB Junior Squad as the youngest representative of his country in the competition, Mat Tarrant's achievement can now be viewed by the masses as he was spotted on the BBC Sport page by one of the WRCjnr Team. Mat (stroke) is pictured below on BBC Sport's Photos of the Day with his pairs partner, Matthew Anker (bow) of the Oratory School. If you would like to follow Mat's progress in the competition then follow this link to the World Rowing website. Mat is rowing in the JM2- event. Following an order being placed in February, coaches and participants will be pleased to know that the WRC launch will be back in action this weekend, with two more launches set to be running at the club by this summers' Wey To Row courses. This great news means that on-the-water safety can be improved, along with coaching, as coaches can be allocated launches, meaning they are closer to rowers, improving the session for both coach and rower. The plan by the summer is to have a coaching vessel, along with a safety vessel (which will predominantly be used in the near vicinity of the club). This means beginners will be more closely monitored, and can be reached and rescued in an emergency much more quickly and efficiently that via using a throw-line, or getting them to swim across to the bank, therefore reducing hypothermia risks. All in all, great news for the whole club, including the Junior Squad. We'd like to thank Caroline Turnbull, Peter Morley and Carl Boon for the help they have provided the club, and the WRCjnr Squad with getting the launches up and running. Please ensure you all check your entry on the ARA site, and those of you who might be registered at clubs other than Weybridge (e.g. Walton, KGS or St. Georges) please add 'Weybridge' to your file. This is most important as you can see below. Can you all please ensure I have your up-to-date ARA number; this is critical. The juniors can update their club membership on-line (I have just tried). From the ARA website, if they log in and then click on 'your account', then click 'my ARA clubs' they can enter Weybridge as their second club. If they have any problem doing this, just ring the ARA and they will update it for you. Could all the juniors who have St. Georges as their first club please add Weybridge as their second - thanks. The OARA program is very straightforward if the people you are entering are registered as Weybridge club members, have remembered to renew their ARA membership and the ARA have the correct details for them. I can only select people who are eligible for that race and so if any details are wrong they do not appear for me to be able to select them - eg. at the moment one of our novice ladies is registered as male and so I cannot enter her for any women's races on line! To help us with our planning of this Summer's regattas, the WRC coaches have put together an 'availability' form for you to fill in and send back to us to let us know which events you are here for, and which ones you're not. Please can you read the attached letter and fill in the form as soon as possible. You can download the letter and the form in Microsoft Word format by clicking here. At over 9,500 viewers of our site, in two years, the WRCjnr Team believe themselves to be well established and running a professional website. However, its really important that you tell the team how you feel about the site, and its features. This is why we've created a feedback form, which is really simple to complete, and will only take up two mintues of your time. You can tell us the good ideas we've had, ideas that you don't like, and features that you'd like to see in the future. Do we keep you updated about the club, and what's going on? How accurate are our training plans? Whatever input you have, its really valuble to us, so please, with two minutes of your time, let us know what you think about WRCjnr. Click here to go to our simple feedback form. The Walton and Weybridge Regatta is approaching apace. This is 'our' event - an important one for Weybridge Rowing Club and for the local area. We wish to enter a number of Junior crews to 'fly the Weybridge flag' and I hope that all of you will make a special extra effort to train regularly so that Jon and I have a good choice of entrants. Also, very importantly, help is needed on the day. Even if you are competing there may be time when you can help with catering, timekeeping and umpiring, safety, stake boats (if these are used, which I think they are) or being a 'runner'. Those of you who are not competing will be able to give more time to the event. I am taking the view that I can volunteer all of you to the Committee; if anyone cannot attend please ensure you let me know. I shall shortly be putting up a registration sheet in the Club room. On the day, the main concern of Jon and I will be to ensure that you guys are all boating properly and we are there to support you 100%. We will probably be boating, as last year, from the grassed area adjacent to St. Georges College boathouse, rather than from our own club. Help is really needed. The existing committee have all been running the event for many years and many need to retire. As Juniors of Weybridge you can take some of the burden of the even from them by doing the jobs I've described above. If your parents are interested in helping in committee roles, please do let me or one of the other Weybridge 'senior' people (like Caroline, John, Carl) know. Weybridge Rowing Club already provide key roles within the committee in the areas of catering, sponsorship and advertising, programme production and the Secretary of the event. Without further help and replacements on the committee, there is a serious danger that the Regatta just won't happen next year which would be an awful shame as it's been going since the 1920's. I am sure I can count on your support. It’s always a nervous time for us Coaches before any regatta or regatta season, and Evesham this year was no exception. Why I hear you ask? Well quite simply in preparing you all for competition nothing can be taken for granted from the type of training you’ve done, to selecting the crews, to booking of the boats. From a training perspective for some the amount of preparation wasn’t ideal. I refer particularly to the doubles of Oli and Matt B and also Kirsten and Matt. In both cases there were some outstanding performances which bodes well for the season ahead. Yes Matt and Oli lost in their final on Saturday but won considerable praise from a number of very experienced coaches. This praise is excellent recognition of what were doing at the Club and all credit to the 2 of them. Kirsten bravely took a single for the 1st time in 2 years. She sculled exceptionally well and although losing, she gave everyone a real insight into what can easily be achieved. It was sad to see the 2 James’s not being able to compete in later rounds for reasons outside their control. They did however send out all the right messages that they are a combination that cannot be taken lightly. Alex bravely took on the challenge of the racing in singles at Jun and S4 on both days. His sculling showed considerable improvements on last year despite having to wait for a considerable length of time on the water for a race that sadly he got beaten. I think I can safely the highlight of the weekend was the J15 2x on the Sunday. Personally I get a great thrill out of each and every win we achieve and to no lesser extent in seeing performances that show we are up there competing with other clubs on much closer terms than we’ve ever done previously, however Jack and Fred’s win in the J15 2x over a very quick Bideford crew was it. The thing that made this win so special was the high level of sportsmanship displayed, where the Bideford kids actually made the effort to seek out Jack and Fred to congratulate them. In terms of learning points, the reason for the greater success on the Sunday was not due to the shorter distance, but that everyone made sure they’d taken on board food and liquid within a sensible time after each race. I know it took some nagging to get the ball rolling however, it needs to become an essential part of the race preparation, particularly with the onset of much hotter weather and more competitive racing. I would also like to congratulate each and every one of you for your time management over the 2 days. It showed a continuation of the improvements made last year. My thanks go to Andrew, Paul and Nick for their excellent marshalling of you all, Caroline and John T for just being there and to my chief partner in crime Clive for not only towing the trailer but also the immense amount of time and care put in to make sure everything is planned and carried out smoothly. Finally my thanks go to you kids who through your commitment to realising what with a lot of work can be achieved, makes the time we spend supporting you worthwhile. The regatta season kicked off for Weybridge last weekend up in Evesham. Weybridge had crews racing over the entire weekend (1000m on Saturday, and about 500m on Sunday). In true Evesham style, the event ran later than expected (finishing 2 hours late! ), but nonetheless, a good time was had by all. The racing started early (at about 08:30!) for Alex Tarrant, racing in senior 4 singles. He beat a sculler from Warwick by 2½ lengths; followed by a sculler from City of Bristol by 2 lengths. His series of wins then came to an end as he was beaten by a sculler from Staines. Alex had also entered in J18 singles, but was beaten by a Hereford sculler in his first heat. James Coxhead and Jack Shepherd had both entered J15 singles. The J15 1x entry was so huge this year, it had to be split into two divisions; with James in division A and Jack in division B. James, who had been "carbo loading" since he woke up, was due to race a Windsor Boys School sculler, but automatically got through the semi final has his opponent had scratched. He then raced another Windsor Boys School sculler in the semi-final, but after some tactical steering and almost catching his opponent, James had lost by ¾ of a length. It was later revealed that James’ competitor’s dad was actually one of the GB teams coaches, and that his brother was also in the GB squad, so James didn’t feel too bad about his loss. Jack had a few more races than James. He easily won his first heat against a Bristol Ariel sculler, but was then beaten by the overall winner of the J15 B division. Matt Beagley had entered the novice singles. He was beaten by a Hereford sculler, but wasn’t too bothered by this as his loss meant he could save energy for his novice double with Oli Tomalin. Matt and Oli’s double got off to a flying start in the heat, and beat Evesham easily. They then went on to beat Bridgenorth, which then took them through to the final. Unfortunately, half way through the final they seemed to miss a stroke, allowing their opponents from Warwick to catch up. Matt and Oli quickly caught up in the last 300m, but the staggered finish meant that they were beaten by ¾ of a length. Although both Oli and Matt were disappointed, they did very well to get through to the final as this was Oli’s first regatta. Alex Tarrant had yet another early start. He was on the water at 08:30 again for yet another S4 singles race. He beat a Staines sculler by a length, and had a closer match with a Worcester Grammar School sculler, but beat him by ½ a length. Unfortunately, he got knocked out in the following round by a Staines sculler. Like the previous day, Alex had entered J18 1x as well. Unfortunately, he wasn’t as successful in this as he got knocked out in the first heat by a Hereford sculler. James Capel and James Piercy travelled up to Evesham after a successful day at Chiswick Regatta with St Georges College. They beat a Ross/Evesham composite J14 double by ½ a length, but unfortunately decided that they were too tired to compete in the next round after the preceeding day's endevours, and scratched. Matt and Oli decided to give their novice double a second try, but were beaten by a double from Winchester House School. James Coxhead and Jack teamed up to compete in J15 2x. Their opposition (Wycliffe Sculling Centre) managed to capsize on the way up to the start, which meant that they had to wait until they could race. An hour later, and they raced the crew that had capsized and won easily. They then went on to race an Evesham crew, who they completely surprised and beat by 2½ lengths, and in doing so upset the Evesham strokeman who then preceeded to throw a strop. This then got them through to the final, where they raced a crew from Bideford who beat them last year. With 200m to go, they stepped up the rating and power, and beat Bideford by ¾ of a length. Kirsten Owens entered WJ15 1x, and came up against a sculler from Avon County. Whilst Kirsten looked strong, she got beaten by just ½ a length. Charlie Capel entered J12 1x, and although looking confident, he unfortunately got beaten by a Hereford sculler. Matt and Kirsten teamed together to create a mixed novice double known as "Beauty and the Beast". They beat a double from Warwick, and then easily beat another Warwick double in the final. You can check out the offical winnings on our Results page. WRCjnr is proud to announce that from today WRCjnr.com is sponsored by AMCR. Marc Bakos, AMCR Chief Executive Officer said, "They seemed fantastic club with great potential, something I really wanted to help and contribute to". AMCR, is a local business specialising in website design, computer repair and personal services. If WRC members quote the reference "WRCjnr247" when placing their order with AMCR, they will receive up to a 20% discount*. From today you can now find us online at our new location www.wrcjnr.com, so please update your bookmarks, prime your browser and get ready for a new online age, thanks to AMCR - 'Living in a World of Clarity'. With the Regatta Season and the increased level of Pleasure Cruiser traffic fast approaching it’s essential that the value from each training session be maximised to the full. At this important stage of the year I would remind you that Session Times are a guide to Boating and not just Arrival as is the custom. This also applies to off water training as well. With that in mind everybody planning to attend a session needs to be there a minimum of 15 minutes before the session starts to be allocated to a boat. Every effort will be made to ensure you know which boat and or crew that you’ve been allocated to in advance along with the programme for the session. Once you’ve been told what you will be doing its essential that you get out on the water without delay so that there is no queue to boat and those returning can get clear of the landing stage quickly. Firstly and most importantly you will notice particularly on Saturday that we will be minus 5 of our squad members. I refer particularly to Oli, Jack, James (Fred), Kirsten and Diana who have been selected to race for the Lower Thames Region at the Inter Regional Finals at Nottingham. This competition is, apart from the GB Trials which Matt T is doing, the most prestigious competition that purely the club based athletes at Weybridge have done. If you bolt this on to the fantastic efforts and achievements of the St Georges based Weybridge athletes you can rightly feel part of something special. Be under no illusion the list of those achievers does not start and end with them it includes you as well. Secondly we need to ensure that the landing stage is kept as clear as possible so that all club athletes can benefit. Does this mean the end of the fun aspect of each session? Quite simply No, as all that’s happening is the fun time is being moved to where we can all enjoy it. Before we begin, its worth noting that the CRB checks are free, as you are applying as a voluntary coach. When your application form arrives please check that it says Disclosure Type: Enhanced. If it does not please ring the Call Centre back and ask them to send you the correct level. B13: Check that the position you are applying for is correct. See roles that can be checked for further information. B14: This should be your club. If the CRB have filled in Amateur Rowing Association, please cross out with a single black line and write your club's name neatly in the white space below. B15-19: Is the address of your rowing club. C20-27: Complete only if relevant to your circumstances. C28-32: Mandatory - please complete. It is only necessary to complete this section if you have been at your current address for less than five years. If you need to include more than one previous address you might like to use this form. Mandatory - you may wish to look at the ARA's policy on the Recruitment of Ex-offenders (SPCG 14). You have now completed your part of the form and you need to take it, together with at least three original identification documents, to your Club Welfare Officer (Theresa Capel). If you can take a passport, driving licence or utility bill that would be ideal. Your CWO will then record the details of some of these documents in Section X and will use a documentary evidence sheet to note that at least two have verified your current address. It is then your CWO's responsibility to send the application form, together with the documentary evidence sheet and if relevant the address history, directly to the Child Protection Officer at ARA HQ for completion of Section Y. Following yet another head on collision between two clubs on our stretch, the WRCjnr Team would like to remind all clubmembers about safe navigation of the river. Remember that when coxing, the band should always be on your right-hand side and when rowing/sculling, the bank should be on your left-hand side. Can all steersmen and steerswomen please ensure they stay to the correct side of the river and not stray into the middle or the opposite side. When overtaking you want to move out of the bank and use the middle of the river as your passage past the slower crew. Please check that there is no oncoming river traffic before you over take, and that you give the crew you are overtaking a shout to make sure they hug the bank. The corner inbetween the Bottom Cut Bridge and Walton Bridge and the one between Walton Bridge and The Sea Cadets are notorious for people cutting them. Please do not cut corners as you cannot see what is coming round them. If a crew is coming at you on the wrong side of the river, give them a shout and order them to move to the correct side or tell them to 'hold it up' if they are very close. Be authoritative. Poor steering will be result in punishment as it puts the safety of yourselves and other river users at risk, as well as the boats and blades. All WRC members will be reminded of correct river navigation over the coming weeks. Seriously dangerous levels of the chemical dihydrogen monoxide (DHMO) have been detected in the river yesterday, meaning that all users should take care not to come into contact with the substance. The chemical, also known as hydroxyl acid, has recently been linked to three different types of cancer and is known to cause extreme skin damage and irritation. Lirpa Loof, an expert scientist described the chemical, "it is colourless and has an odor similar to wet grass," he continued, "contact with this substance may cause nausea, bloating, excessive sweating and urination," anyone who experiences any of these symptoms or suspects they have been in contact with the compound should seek medical assistance immediately. If you have any questions please email the WRCjnr health team immediately. James Coxhead, known to most members as Fred, competed at the NJIRC (National Junior Indoor Rowing Championships) on Wednesday, putting up a great fight against other juniors in a tough race. "Imagine a room full to the brim with rowing machines," James quoted, "now double that room - it was quite some race." The year 10 boys raced for an exiting five minutes with the lead changing all the time. "It's very exiting, you can always see on the big screen what was happening," James said, shortly after completing his five minute piece. After travelling a fantastic 1404m, he finished 12th out of 58, with less than 50m between him and a medaling position. A great result and we look forward to sending more juniors to the competition in the future. I'm taking part in the Cycle London to Paris 2007 on 29/07/2007 to raise money for Big Issue Foundation and would really welcome your support. All donations are secure and sent electronically to Big Issue Foundation. If you are a UK taxpayer, Justgiving will automatically reclaim 28% Gift Aid on your behalf, so your donation is worth even more. Please join us in supporting Big Issue Foundation and a fabulous cause. James has been a loyal member at Weybridge Rowing Club for quite a while now, and also assists with coaching the juniors. The WRCjnr Team would like to wish him good luck in his worthwhile fundraising. The format of this race was 2 lengths of the 2k Dorney Lake. The final result was decided by the total time of the two lengths. The quad came 5th overall, out of 21. A very pleasing result for the J16 scullers, only losing out on a medal by 7 seconds, and only 4 seconds off Maidenhead in 4th. The quad show huge amounts of promise for last few months of the season. Also, congratulations to those who raced in the J15 4x+ (stroked by Weybridge RC member, Dan Fisher)and came 10th; and the J14 8x (containing Weybridge RC members Olivia Conroy, James Capel and James Styles)who were narrowly beaten into 4th place. This crew came 1st out of 13. For a scratch four, who had never rowed together before the race, it was a promising result which can be improved still in the future. This crew brought in yet another 1st place result for St Georges - their 2nd of the event (only Shrewsbury matched this feat). This crew showed a promising row, with a win of over 9 seconds. Another congratulations to the J15 4+ who came 2nd in a strong field of competitors. The boat was stroked by Weybridge RC member, James Amico. Weybridge RC members Matthew Tarrant and Alex Tarrant also took part in the Schools Head, rowing for Walton RC. Mat, who is pushing for a place in the GB Junior Squad, was part of the Walton 8 that placed joint 6th with Eton in the 1st 8s catagory. Mat's brother, Alex, rowed in a Walton J4+ but his boat suffered numerous mechanical failures including a collapsed rigger and a broken seat, and his crew were not able to deliver the result that they deserved. Photographs from the Schools Head are available from Jet Photographic, Natures Images, Big Blade and Eliot George. Photos from the National Junior Sculling head are available from here. If you have any of your own photographs, please send them in by clicking here. With red boards for several weeks now, everyone has been thinking about getting back on the water, and across the weir - something that seems quite impossible for Weybridge Rowers at the moment. Unfortunatley the forcast predicts worse weather to come this week - more rain and wind. The closure of the Shepperton 'B' weir hasn't helped matters (see 2006 News), but that weir is not set to open for months yet. The force of the stream from the weir is strong currently, and over the week it seems unlikley it will die down. Should there be any changes to the stream and its conditions, our WRCjnr Health & Safety team will be informing you. Remember if you are rowing in these conditions to be safe, cautious and sensible. It is dangerous, and the coach to boat ratio should ideally be 1:1. This year, Wey To Row summer sculling courses are back - bigger and better than ever. Chris Jones and Jack Percival, along with a team of new coaches, lead the newly renovated course in the summer of 2007. The course, held at Weybridge Rowing Club is an excellent opportunity for young Surrey children to get involved with the fantastic sport of rowing. From 9:30am until 1:30pm on the Monday - Thursday, two structured rowing sessions will be held with a mix of land based games, ergo technique, water technique and endurance training - an excellent opportunity for young children to challenge themselves, yet still have fun along the way. On the Friday, there will be two structured sessions, followed by a mini 'Regatta' where parents can come and watch, as well as a talk from our sponsors - Weybridge and Walton Physiotherapy. The course is aimed at those in school Year 8 - and our age range is from 12-14. You can find out loads more information, including application forms, brochures and safety documentation by visiting the official 'Wey To Row' website - http://weytorow.googlepages.com or click here. 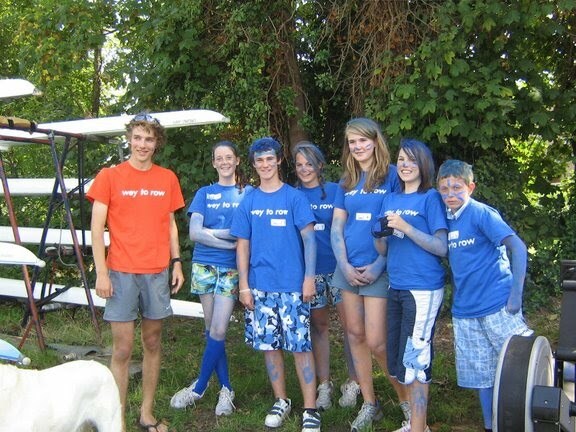 You can also contact the Wey To Row team - just email weytorow@gmail.com. I am collecting orders for Weybridge Rowing Club official kit for an order to Powerhouse which I will place at the beginning of March. It is prudent to allow at least 4 weeks for delivery from placing the order to Powerhouse. Can I remind all members that an official Weybridge Rowing Club All-in-One is required when competing in events. 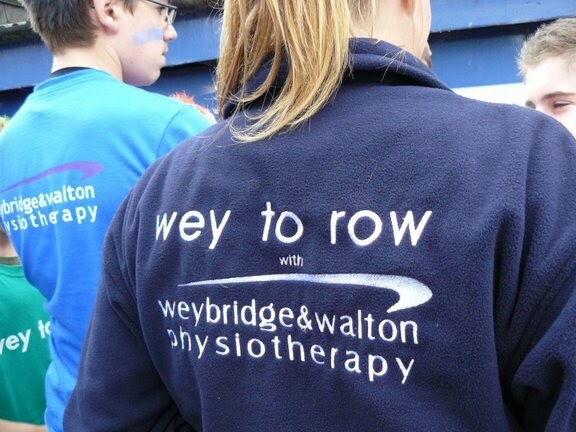 All Junior members must wear a Weybridge Rowing Club T-shirt when at the club for training or for events; the Club would like to extend this to all members, so as to promote a solid sense of identity. If you would like to contact Clive about kit then click here to email our team, who will pass your message on to him. Alternatively you can see him down at the clubs on Tuesday and Thurday evenings and at weekend training sessions. Following Weybridge Rowing Club offering a UKCC Level 2 course, many members of the WRCjnr Coaching Team have signed up and achieved their Level Two coaching qualification. The competition will be open to all interested clubs and schools, it is not restricted to London clubs or schools so if you think youknow someone that may be interested then please do let them know." If you are interested in the Ergo competition then email the WRCjnr Team or see Jon Beagley. Not only is there a fantastic new range of products in our online Shop and free delivery until the 14th Frebruary (when you quote 'Valentine07' as a discount voucher), but you can now track your WRCjnr Spreadshirt order. Simply email the WRCjnr Team - making sure you include your name, the product you ordered and when you ordered it - and we will be able to tell you what stage of production your product is in and an estimated date of delivery. Our official WRCjnr clothing range suppliers - spreadshirt.net - have kindly offered to pay for all the postage and packaging to all WRCjnr members who order any product(s) from our shop before mid-February. All you have to do is click here, to visit our Shop and choose from any of the great, new clothing options, and just quote 'Valentine07' as a discount voucher. Should you wish to order a custom product (e.g. with Name etc) you can do so for no extra cost by e-mailing our team. You can view sample custom made products by looking at the official WRCjnr Shop now. So if you've got any requests, don't hesitate to contact us, and happy shopping! The display from the Weybridge Rowing Club Junior Squad members on Sunday 14th at Maidstone was somewhat promising for the new year of 2007. On a fantastic sunny day, with beautiful river conditions Weybridge Rowing Club hit the water at Maidstone Small Boats Head for what promised to be an outstanding day of results. Diana Llewellyn/Kirsten Owens - WJ16 2x WIN - Once again another admirable win for the unbeatable duo. With three consecutive wins in a row, they seem unstoppable. Kirsten and Diana also achieved the fastest Woman's double of the day. Chris Jones/Matt Beagley - Novice 2x WIN- After only two previous outings in a boat together the compatibility of Matt and Chris proved to be impressive, with the pair pulling in a 15 second victory. Katy Lynch/Rowenna Bowen - Women's Novice 2x WIN- A brilliant race following months of intensive training for the girls produced a well deserved first ever win for Katie and Rowenna, with hopefully many more to come. Well done to all the Juniors listed, it was a promising display, which can hopefully be replicated in the future. Photos are available now here. Windsor Boys School BC are holding their annual run around Windsor Great Park for rowers and coxes next Saturday (20th Jan at 2:30pm; so you will have a normal training session in the morning). The run is about 3 miles, the average runner usually finishes this in about 25 minutes. The entry fee is £3 (I think you pay on the day). If you're interested in taking part, then please email the WRCjnr Team who will forward your email onto me. Make sure that you include your age group (J14, WJ15, etc); but if you unsure of this then put down your date of birth and we will work out your age group. I need all entries by tomorrow evening (14th January) at the very latest! I think Jon will be scouting for entrants at Maidstone tomorrow. The Racing Timetables have been updated to include this weekend's Maidstone Small Boats Head. If you know you are racing in this event please head over to the Events page and download the timetables so you are sure of your race time. Can we remind all parents and WRC compeitors that Weybridge has built up a fine reputation for its vocal support at events so can we continue our loud streak into this year and show our support! The WRC Event Calendar has been updated to include (most of) 2007. It contains some important dates for your diary, as well as proposed crew lists for races. Head over to the Events page to download the calendar in Microsoft Excel format. We would like to remind you to email us to tell us whether you will be away whilst any events are on so that we can add it to the calendar and keep the whole club informed. Check the Events page regularly for updates to the calendar so that you can be sure you don't miss anything. A first race for the new season for all the Weybridge members - Maidstone Small Boat's Head. For all the information you need about Maidstone - click here to see the poster. At least 2 changes of clothes. One set for racing, and two sets of clothes to keep you warm when you aren't racing. A towel - if you get wet during your race(s) it's important to get as dry as possible before changing into new clothes. Drinks - Try to avoid bringing hot drinks, they're not as good for you as water, or energy drinks, although they may seem appealing. It's important to remember even after your race, that water will replenish lost water a lot more effectively than coffee, or tea. Food - as always remember to eat well the evening before your race - try to take on as much carbohydrates as you can, this will help you in the head race. On the day, make sure you take small bites of fruit, or snack bars. Avoid crisps, bread and fatty foods. Chocolate or 'break' bars are ideal, just taking a bite at a time. Race Numbers - If you are wearing a training top on top of your racing kit (as suggested) ensure that you wear your race number on both items of clothing (i.e. Training top and racing kit). Have a good race, and stay warm, healthy and safe on the water. For any more safety advice and health information, contact the WRCjnr team by clicking here. Happy New Year from us all at Weybridge Rowing Club, and here's to another prosperous and successful season for the club. The WRCjnr Team are currently archiving some of the pages on this site, so please bear with us if some links are temporarily broken or pages don't load as they should. The site will be fully prepared for the up and coming year by Friday. We would appreciate any feedback you may have on the way in which last year's pages have been archived, eg. Do you find it easy to navigate between years on certain pages? & Is it clear to you what year's page you are viewing? If you have any feedback please email us at wrcjnr@gmail.com.